Spring hasn’t even sprung yet. It happened one morning on my bike commute to work. I noticed what seemed like a random thing that didn’t make sense. I rode past a mattress and a box spring dumped on the side of the road. 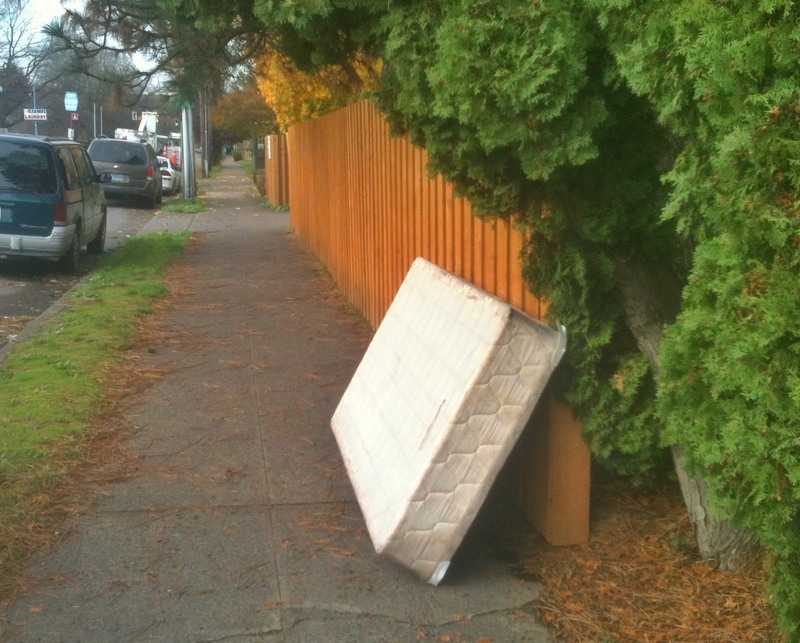 Then, not too much further down the road, I saw another mattress. I was in a hurry or I would have taken pictures because the mattresses were out of place. They weren’t in front of houses but had been tossed on the side of the street. Sure, mattresses are a challenging disposal nuisance. Then again, it seems like it would be a difficult job for a lone mattress assassin to dispose of a mattress on the side of the road. So why doesn’t one of the two people dragging the mattress around cave and admit that there might be a better way to get rid of bed junk. After work I rode home and spotted a mattress sitting on top of a fire hydrant while leaning against a street sign. It had me thinking that the day could have been set aside for a city-wide mattress pick up. I went to look for the other mattresses I had seen in the morning to take pictures with visions of such exotic trash in the grass becoming high-art. They were gone. Some time during the day the offending slumber pads had been cleaned up. I was shocked. 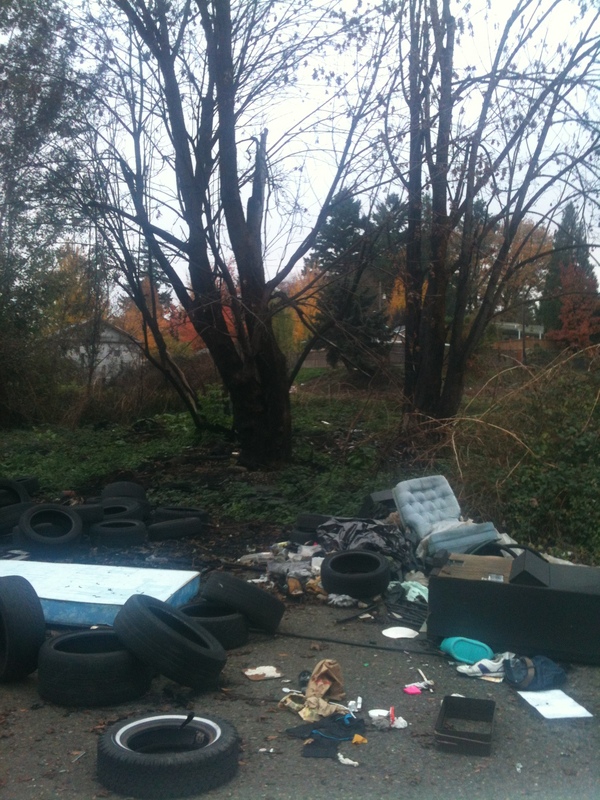 I headed over to a dump site that has sprung up in the vicinity of the Kenton neighborhood where I had seen a heap of mattresses and box springs. It seemed like someone may have gathered up the cast off mattresses and added them to the pile in the empty parking lot that is now full of disposed tires, a TV set, and family room furniture. That morning the mattresses had seemed like collateral damage from a mattress battle. 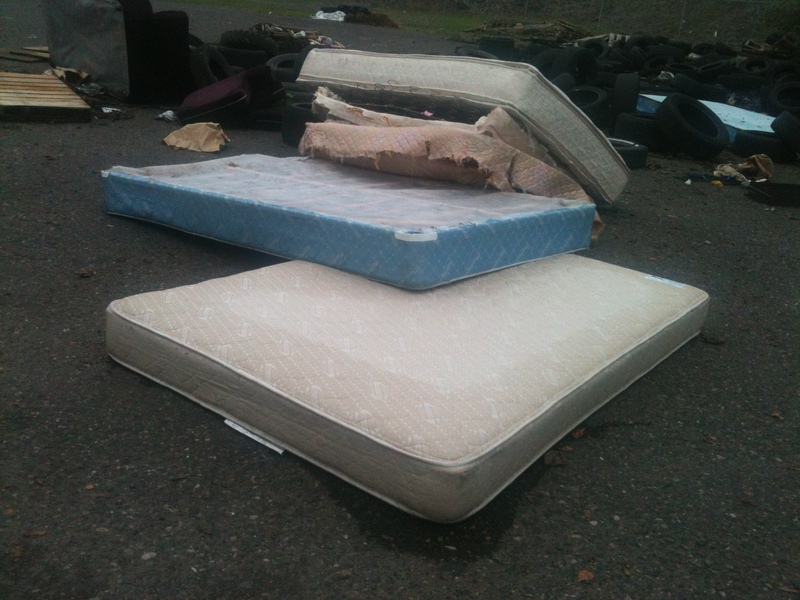 Sad, sick and bleeding–dead mattresses were now looking sadder still. I initially thought of this piece as a rumination on the idea of what to do with stuff and how to get rid of it when the time comes. It’s really not that difficult given that our crack investigative team got off their duff and did some internet research that found a quick solution. Last night I drove passed a mattress propped up against a tree while coming back from the Roseway Theater. I fought off the compulsion to stop the car and take pictures. It struck me that dragging anything to the curb and making it someone else’s problem or high-art daydream is no disposal solution. 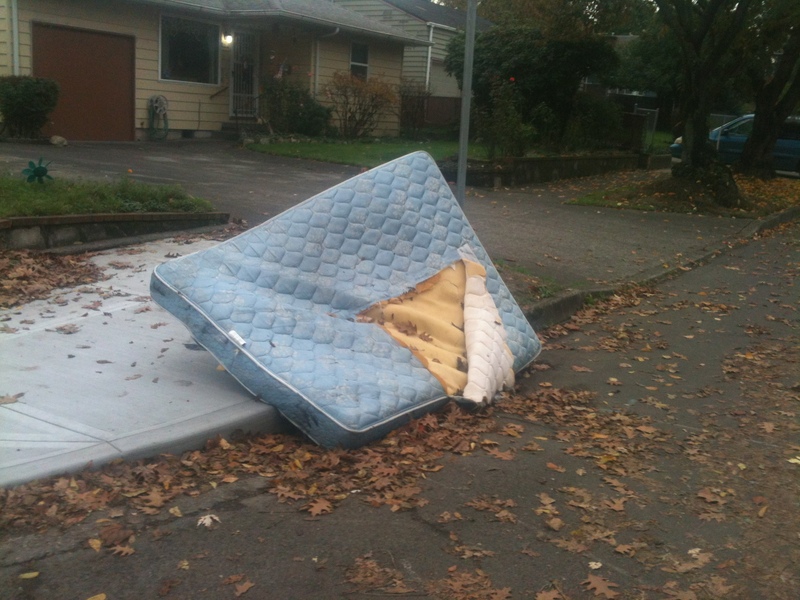 The Orbit investigation revealed that mattress disposal doesn’t hit the wallet too hard. The job can be done for $20 per mattress and another 20 for a boxspring and I’m even guessing that these folks don’t discard the picks-ups in an empty lot dump site but even if they do, you have to pay to have someone do your dirty work. In the end, empty parking lots seem like the sneakiest and cheapest way to go. There’s a link above for a mattress recycling company, it’s a plug for them because I consider this piece a public service announcement. It will all be worth it if I can keep even one mattress off the streets.